Robert Stallworth interviewed January 2014. Earlier last month I received an e-mail from a reader of the blog, from the San Francisco Bay Area. 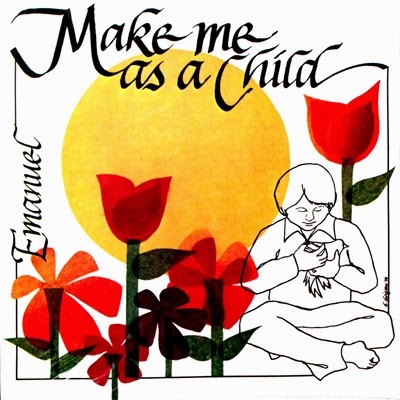 She inquired about a 1978 gospel folk album she found at Rasputin's used record store in Berkeley, entitled Make Me As a Child, by the group Emanuel. It appeared the group was from Denver. She sent me pictures, and I immediately noticed a familiar name, Robert Stallworth. You may remember, back in May 2012, I wrote a piece about a doo-wop group out of Denver (by the way the most-read piece, according to my blog stats). One of the members was one Robert Stallworth. Could they be one in the same? So I found Robert's contact info, sent him an e-mail, and received an almost-instant response. "I must say, somebody has really been doing their homework," he replied. "The group was organized by Peter Quint, Steve Menhennett and David Roos. I and Lois Miller were also in the group. These five persons all lived at 1366 Clayton Street in Denver, in a moderately large but old house. Peter, Steve, David and I were all medical students at the University of Colorado in Denver. Lois Miller was the wife of Freeman Miller who was also a medical student. Freeman wisely chose not to sing. Also in the group were Robin Sievers, Luanne Farmer and Brenda Hicks. "We were relatively young in our Christian faith. David, Steve and Peter had elements of expertise with the guitar and Peter also played piano. I had some singing experiences even before coming to Denver (with a side from The Five Bucks years earlier). We weren't really a performing group. We may have sung at one or two churches or functions. "We began rehearsing at the house. David Roos brought in Brenda and Luanne. Eventually, we recorded the songs on the album. "The record was cut in Denver at American Recording Studios and I have no idea how many copies were pressed. To my knowledge, the record did not sell well as there was no real promotion of the album. Of the 11 songs on the album, eight were written by Peter Quint and three by Steve Menhennett. "Four of us graduated in May of 1978. This effectively broke the group up. The entire experience was less than nine months in length." Robert Stallworth sings lead on three of the songs, "Pilgrims," "To Each Of God's Children," and "Hail Mary."